For his grandson and former Prime Minister of Greece, see George Papandreou. For the Greek historian and linguist, see Georgios Papandreou (historian). Georgios Papandreou (Greek: Γεώργιος Παπανδρέου Geórgios Papandréou; 13 February 1888 – 1 November 1968) was a Greek politician, the founder of the Papandreou political dynasty. He served three terms as prime minister of Greece (1944–1945, 1963, 1964–1965). He was also deputy prime minister from 1950–1952, in the governments of Nikolaos Plastiras and Sofoklis Venizelos and served numerous times as a cabinet minister, starting in 1923, in a political career that spanned more than five decades. He was born at Kalentzi, in the Achaea region of the northern Peloponnese. He was the son of Father Andreas Papandreou, an Orthodox archpriest (protopresvyteros). He studied law in Athens and political science in Berlin. His political philosophy was heavily influenced by German social democracy. As a result, he was adamantly opposed to the monarchy and supported generous social policies, but he was also extremely anti-communist (and specifically against the KKE's policies in Greece). As a young man, he became involved in politics as a supporter of the Liberal leader Eleftherios Venizelos, who made him governor of Chios after the Balkan War of 1912. One of his brothers, Nikos, was killed in the Battle of Kilkis-Lachanas. He married twice. His first wife was Sofia Mineyko, a Polish national, daughter of Zygmunt Mineyko and paternal granddaughter of Stanislaw Mineyko (1802 - 1857). Their son Andreas Papandreou was born in Chios in 1919. His second wife was the actress Cybele Andrianou and their son was named George Papandreou. During the political crisis surrounding Greece's entry into World War I, Papandreou was one of Venizelos's closest supporters against the pro-German King Constantine I. When Venizelos was forced to flee Athens, Papandreou accompanied him to Crete, and then went to Lesbos, where he mobilised anti-monarchist supporters in the islands and rallied support for Venizelos's insurgent pro-Allied government in Thessaloniki. In 1921 he narrowly escaped assassination from royalist extremists. The leadership of the 1922 Revolution, Colonels Plastiras and Gonatas, with their political advisor, Georgios Papandreou senior (left). In the 1920 general election, Papandreou unsuccessfully ran as an independent liberal in the Lesvos constituency. From January to October 1923, he served as interior minister in the cabinet of Stylianos Gonatas. In the December 1923 elections, he was elected as a Venizelist Liberal Party member of parliament for Lesvos, and served as finance minister for just 11 days in June 1925, education minister in 1930–1932 and transport minister in 1933. As minister of education he reformed the Greek school system and built many schools for the children of refugees of the Greco-Turkish War. In 1935, he set up the Democratic Socialist Party of Greece. A lifelong opponent of the Greek monarchy, he was exiled in 1936 by the Greek royalist dictator Ioannis Metaxas. Following the Axis occupation of Greece in World War II, he joined the predominantly Venizelist government-in-exile based in Egypt. With British support, King George II appointed him as PM and under his premiership took place the Lebanon conference (May 1944) and later the Caserta agreement (September 1944), in an attempt to stop the crisis in Greece and the conflicts between EAM and non-EAM forces, a prelude of the civil war. After the evacuation of Greece from the Axis powers, he entered Athens (October 1944) as Prime Minister of the Greek government-in-exile with some units of the Greek army and the allied British. During the same month, he became prime minister in the Greek government of National Unity [el], which had succeed the Greek government-in-exile. He tried to normalize the highly polarized situation between the EAM and non-EAM forces, collaborating mainly with the General Ronald Scobie, who was under treaty responsible for all the Allied forces. Although he resigned in 1945, after the Dekemvriana events, he continued to hold high office. From 1946–1952 he served as labor minister, supplies minister, education minister, finance minister and public order minister. In 1950–1952, he was also deputy prime minister. The 1952–1961 period was a very difficult one for Papandreou. The liberal political forces in Greece were gravely weakened by internal disputes and suffered electoral defeat from the conservatives. Papandreou continuously accused Sofoklis Venizelos for these maladies, considering his leadership dour and uninspiring. In 1961, Papandreou revived Greek liberalism by founding the Center Union Party, a confederation of old liberal Venizelists and dissatisfied conservatives. After the elections of "violence and fraud" of 1961, Papandreou declared a "Relentless Struggle" against the right-wing ERE. Finally, his party won the elections of November 1963 and those of 1964, the second with a landslide majority. His progressive policies as premier aroused much opposition in conservative circles, as did the prominent role played by his son Andreas Papandreou, whose policies were seen as being considerably left of center. Andreas disagreed with his father on many important issues, and developed a network of political organizations, the Democratic Leagues (Dimokratikoi Syndesmoi) to lobby for more progressive policies. He also managed to take control of the Center Union's youth organization, EDIN. Papandreou had opposed the Zürich and London Agreement which led to the foundation of the Republic of Cyprus. Following clashes between the Greek and Turkish communities, his government sent a Greek army division to the island. King Constantine II openly opposed Papandreou's government, and there were frequent ultra-rightist plots in the Army, which destabilised the government. Finally the King engineered a split in the Centre Union and in July 1965, in a crisis known as the apostasia or Iouliana, he dismissed the government following a dispute over control of the Ministry of Defence. After the April 1967 military coup by the Colonels' junta led by George Papadopoulos, Papandreou was arrested. Papandreou died under house arrest in November 1968. His funeral became the occasion for a massive anti-dictatorship demonstration. He is interred at the First Cemetery of Athens, alongside his son Andreas. During the Junta and after his death he was often referred to affectionately as "ο Γέρος της δημοκρατίας" (o Géros tis dimokratías, the old man of democracy). 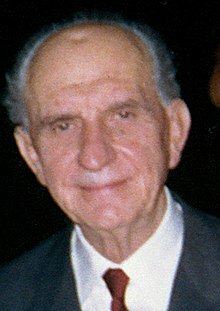 Since his grandson George A. Papandreou entered politics, most Greek writers use Γεώργιος (Geórgios) to refer to the grandfather and the less formal Γιώργος (Giórgos) to refer to the grandson. In 1965, the University of Belgrade awarded him an honorary doctorate. ^ David Wilsford, ed. Political leaders of contemporary Western Europe: a biographical dictionary (Greenwood, 1995) pp 368-75. ^ Who's Who in Greece. Athens: Athens News. 1959. pp. 255–256. Kassimeris, Christos. "Causes of the 1967 Greek coup." Democracy and Security 2#1 (2006): 61-72. Wilsford, David, ed. Political leaders of contemporary Western Europe: a biographical dictionary (Greenwood, 1995) pp. 346–75. Wikimedia Commons has media related to Georgios Papandreou. This page was last edited on 12 March 2019, at 20:17 (UTC).